What newspapers are doing between the Print and Online Versions is beginning to really question their integrity and reveals why mainstream media is just not trustworthy any more. So if you Google something, it’s the online version that will come up – not the print edition. So they can print anything and then post online something completely different to defeat a Google search and mislead the public once again. 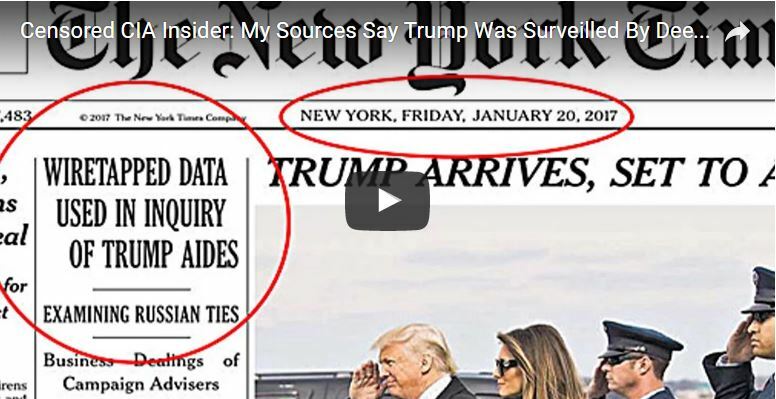 The New York Times changed what they reported in the “print” edition that clearly stated “wiretapped data” monitoring Trump’s people before the election in Watergate Style probably after realizing what they said might hurt Obama. Why is there such a stark difference between online and the print edition? Obviously, this is not a mistake. It appears to be a deliberate alteration of reporting. This strange difference between online and print editions of stories seems to be a pattern that is emerging more and more. Mainstream Media is really getting involved in some shady covert manipulation of the pretend news or modern version of propaganda. They are not as smart as they think. The very night of the debut of the Forecaster in London, I was getting all sorts of emails from London with clients saying the London Evening Standard put out a story saying “City bankers are worth every penny of their huge bonuses” attributing it to me. 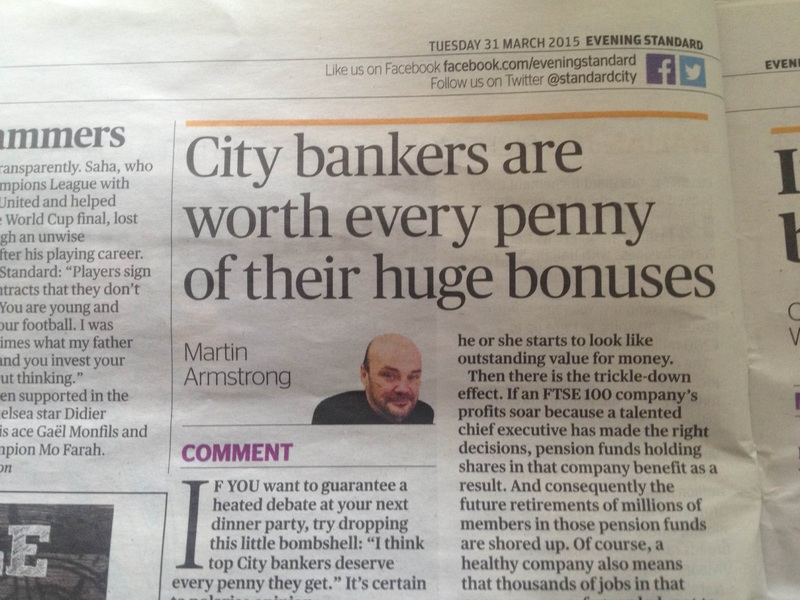 When I went to the online version, it had a picture of a different Martin Armstrong. I responded to clients sending those emails that no, there were wrong. They corrected me photographing the print edition, which had MY PICTURE not someone else who was in the online version. At first, I assumed this was just a mistake. But this practice of putting out two different versions is becoming a commonplace manipulation. In my case, it was the very night of the debut of the film. It was way too coincidental. Obviously, suddenly reporting some head-hunter for banks with the same name using that headline was to make people think the opposite of what the film was all about and not go see it. They could have ran that story any other time. There was nothing taking place in London that warranted such a story since the only critical issue about bankers was the film the Forecaster. This ploy of putting out two versions completely different from the print edition and online edition is to give them deniability. The Washington Post they say Trump is wrong and the New York Times never said such a thing but links to the online version. So one lies and the other swears to it. The Washington Post boldly displays their motto – “Democracy Dies in Darkness” which is something they should practice for they are the dark force spreading darkness over the whole land. This manipulation of the news between the print and online versions is taking place more and more often and it always seems to take place during an issue in controversy – which even included my film. As I reported before, the company that bought the distribution rights for the USA refused to put in theaters. Then NETFIX senior management overruled and would not allow it to be shown on their systems. We live in a world of political censorship. The mainstream media thinks they are clever. These are by no means a simple mistake. The New York Times changing the story for the online version is really showing how low the mainstream media will go to support the Democrats. This is just getting really disgusting. When the press becomes part of the conspiracy against the people, like Pravda (Truth) in Russia under the Communists, you know the state is failing. There would be no reason for the New York Times and the Washington Post to be manipulating the news this aggressively if the state was not failing.